There are likely two reasons why Soulpepper chose to revive American author A.R. Gurney’s 1982 play The Dining Room. One is that it provides a chance to show off the acting range of the company since it demands that six actors play nearly 60 roles. The other is that it serves as good counterprogramming to Dario Fo’s Accidental Death of an Anarchist, currently playing to February 21. Where Fo’s play is unapologetically left-leaning, Gurney’s is unapologetically right-leaning. Though sometimes satiric, Gurney more often trades in nostalgia for the decline of the culture of upper middle-class New England WASPs as represented by their dining rituals and symbolized by their dining rooms. This kind of play might have succeeded in the 1980s when older people could still remember the traditions Gurney portrays. But now in 21st-century multicultural Toronto, a lament for the way of life of well-off WASPs seems bizarrely out of place and irrelevant. In the 1980s the conservative values of Gurney’s play would have seemed balanced by its unusual structure. The play has no major characters and does not tell a story. Instead, it presents eighteen unrelated scenes united only the same shared location, the dining room of the title, and references to what the room represents. The scenes covers a time period from the 1930s to the 1980s but do not occur in chronological order. Sometimes scenes overlap, with characters entering before the previous scene is over or remaining on stage after their scene in done. Thus, the non-hierarchical, non-linear nature of the structure contradicts the hierarchical nature of the society and the linear nature of the decline Gurney depicts. Caryl Churchill uses a non-hierarchical, non-linear structure in Top Girls (1982), but in that play there is a single story to sort out and the non-hierarchical structure reflects the play’s own thematic attack on the oppression caused by hierarchies. In Gurney’s play there is no story to sort out and the structure does not reflect the theme except that today’s world is chaotic unlike that of the good old days. This makes the playgoing experience quite difficult since there is nothing in Gurney’s play to hold on to except his throughline of lament for values many will likely not share. Gurney presents the model of WASP society in the third scene which is also chronologically the earliest. 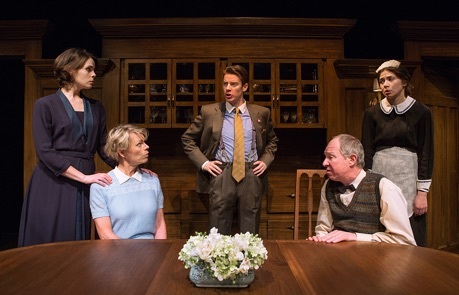 There is a self-assured, slightly aloof authoritarian father (Diego Matamoros) at the head of the dining table, a dutiful wife (Brenda Robins), a maid (Sarah Wilson) and two children (Jeff Lillico and Courtney Ch’ng Lancaster) who long to reach the age when they can dine with the adults in the dining room. We see how when the son reads the funnies, he tries to imitate his father’s reading mannerisms. The parents are models of behaviour and values for the young who aspire to emulate them. The conservative bent of the play is evident in who Gurney satirizes and who he does not. His main source of humour are people who do not follow this model of the ideal family unit with the father at the top, followed by the mother, the children and with the servants at the bottom. We are meant to look down on the young architect (Lillico) whose plans for his psychiatrist client (Derek Boyes) is to gut the inside of the house and turn the dining room into an office and waiting room. We are meant to view as callous the nephew (Lillico) who interviews and photographs his aged aunt (Wilson) about antiquated WASP dining practices for an anthropology paper. We are meant to look down on two teenaged girls in the 1960s (Lancaster and Wilson) who plan to have a booze and pot party in the sacred dining room when the parents are away. We are not meant to sympathize with a young woman (Lancaster) who wants to return home after her marriage and two affairs have failed. Adults also come in for criticism if they break the rules. A boy (Boyes) is ashamed of his mother (Robins) when he comes home to find she is having an affair with his uncle (Matamoros) while his father is away. A woman (Wilson) has trouble holding a birthday party for her daughter (Lancaster) when the man she is having an affair with (Boyes) shows up. Meanwhile, we are meant to get dewy-eyed when hierarchy is followed as when a son (Boyes) agrees to do all that his father (Matamoros) asks for in his funeral arrangements or at the end when the hierarchy of the second scene is repeated and the mother (Robins) dreams of a dinner as in the old days with fingerbowls and servants and the father (Matamoros) makes the toast “To us!” – as if celebrating exclusivity were a positive thing. Among the eighteen scenes, three are genuinely funny. In one, a grandson (Lillico) has been forced by his parents to ask his wealthy grandfather (Matamoros) for money to fund his education at a private school. The way the grandfather toys with the boy’s embarrassment and finally gets him to admit who put him up to it is quite well done. In another a mother (Wilson) says that she will let her young daughter (Robins) choose what to do – she can either go to the theatre with her maiden aunt or go to junior assembly at school. When the daughter chooses the theatre, the mother keeps offering negative views of that decision and keeps asking the daughter to choose again. Luckily, the daughter sees through her mother’s ploy and sticks to her choice, one tiny sign of rebellion. In the third scene, directed in a much more broadly comic manner than the others, a family waits for dinner only to find that the father (Lillico) has to take care of a matter of family honour down at the men’s club. One member made insulting remarks to the father’s brother and now the father feels he must fight with the man. The problem is that the father is so hesitant to say what the insult was. It turns out that the man referred in public to the father’s brother’s “bachelor associations”. The play can be enjoyed just for the sake of seeing the Soulpepper ensemble take on so many roles. Everyone gets to play children and everyone gets to play characters older than they are. Among his many characters, Matamoros is given a series of curmudgeonly old men. He is expert at it but they are hard to distinguish since Gurney has not made them all that different from each other. Sarah Wilson encounters the same difficulty with the series of brittle, uptight older women she is given. It turns out she has a knack for this kind of role, but again Gurney hasn’t done much to distinguish them. Jeff Lillico is, of course, excellent at playing eager boys and callow young men. The revelation is seeing him play an older character so convincingly, like the father in the third scene above. Courtney Ch’ng Lancaster probably has the widest range of roles, from a little girl to an elderly mother with dementia who does not recognize her own children. The range of roles for Brenda Robins and Derek Boyes lies somewhere in between, but they like the other four give completely assured performances of every part. If Gurney had really wanted to tax his cast he would have allowed the actors to play across gender as Caryl Churchill does in the first act of Cloud 9 (1979). The problem is that playing across gender satirizes the conventions of gender stereotypes. It seems that part of the tradition Gurney reveres upholds these stereotypes. People have criticized the popular BBC series Downton Abbey for romanticizing the British class system and an antique way of life that has passed away. Yet, series writer Julian Fellowes always makes sure to underscore the historical reasons for the changes in habit that the aristocratic family and their servants undergo. Gurney does not do this in The Dining Room, even though the period it covers is so volatile. Aside from a mention of the Depression and of a possible new world war, the plays is noticeably devoid of any analysis, historical or otherwise, of what is causing the turning away from tradition that he so bemoans. The play’s jumbled time scheme seems to suggest that the problem lies with the younger generations who just can’t be bothered to keep up traditions as they should. Although the play is labelled a comedy, it is this conservative bent plus its attempt to wreath the demise of the ways of the wealthy in nostalgia that prevent the play from ever being truly amusing – at least not here and now. Photos: Brenda Robins, Derek Boyes, Sarah Wilson, Diego Matamoros and Courtney Ch'ng Lancaster; Sarah Wilson, Brenda Robins, Jeff Lillico, Diego Matamoros and Courtney Ch'ng Lancaster. ©2015 Cylla von Tiedeman.